The Charms of Baggi the Big can be found in the Clan Store and in holiday Invaders' Treasures. The Charms of other Shamans can be found in holiday Invaders' Treasures, Coffers of Jotunheim Monsters, or purchased in Bank offers. There are also special Ghost Hunt Competitions for each Shaman, where Charms are given for passing checkpoints. - Baggi the Big's bonuses are aimed at economic processes in the Town – building and resource production. - Inga the Wise's bonuses reduce the Knowledge learning cost, and increase the warrior training speed and limit. - Ulf the Brave's bonuses are designed for melee – increasing offense, defense, health, and reducing the melee training cost. - Wendla-of-Shadow's bonuses improve scout stats and reduce their training cost. - Einar the Free's bonuses increase siege troop stats and reduce their creation cost. - Stieg the Sharp's bonuses increase the power of ranged warriors and reduce their training cost. - Elsa the Nomad's bonuses are useful for cavalry – they increase offense, defense, health, and reduce the cavalry training cost. - Sibba the Bloody's bonuses improve killer stats and reduce their training cost. - Raine the Wanderer's bonuses will be useful during battles for Fortresses – they increase troop offense when capturing and defending Fortresses, as well as the number of warriors and their offense in Onslaughts. It's important to remember that bonuses are effective only if a Shaman is active, and the bonus value increases together with a Shaman's level. For every level, you receive Skill points that you need to distribute throughout the Shaman's development tree. On level 60, a Shaman collects enough points to unlock all Skills. If necessary, points can be redistributed by applying the Rebirth item. It can be purchased in the Item Store and in the Clan Store for Loyalty Points. Unlike slots for Hero's equipment that are available by default, slots for Shaman's equipment are unlocked with the help of the same Skill points. To craft equipment for a Shaman, you'll need Hero's equipment (standard and Invaders' equipment) or other Shamans' equipment. You can craft equipment of any level in the Forge, but to put it on, the Shaman must be upgraded to the corresponding level. Shaman's equipment, as well as Hero's equipment, can be inlaid with gems and runes to get various bonuses. Once you have collected a set of Legendary equipment, you'll be able to inlay 18 gems and 6 runes into it. 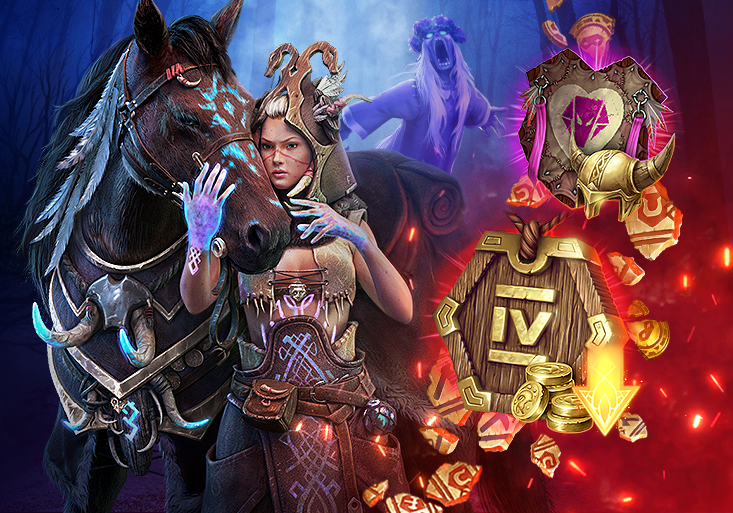 Find out about the bonuses of Legendary runes on the forum. By the way, if you reset Skills, the equipment slots will be locked again, while pieces of equipment will be moved to the Stock in the Forge and their bonuses won't be active. Like your Hero, you can send your Shaman with your troops on an Onslaught. Moreover, only a Shaman can fight special enemies – Ghosts, which requires power. The default power reserve of a Shaman you've just summoned is 1,000 units. This value can be increased by improving the Shaman's Skills, learning Knowledge in the Oracle, activating a Town Skin, and placing your Town in the Valley of the Aesir. To temporarily increase the reserve, use the Shaman's Power item. The maximum available power reserve is 500,000 units. Remember that power restoration only takes place for an activated Shaman. What makes Ghosts especially useful? Their unique drop – rune fragments. The number of fragments that will drop depends on the Ghost's level. Fragments don't have quality, and you can fuse them into a complete rune in the Rune Workshop. There, you can also fuse the runes you already have and improve their quality. By default, the available class of a fused rune is Simple. To fuse runes of a higher quality, you need to learn the appropriate Knowledge in the Shamans tree. Runes give you substantial bonuses and can be inlaid only in Legendary equipment.